Asian kingdoms have grown and fallen with their ability to feed their people and their armies. With what? Rice of course. On a personal note, me loves my sticky rice! In particular I really enjoy the sticky rice varieties like black rice (kow gum). So I couldn`t resist trying to find out more about rice in Laos. In my search I came across this wonderful and cost-free book. 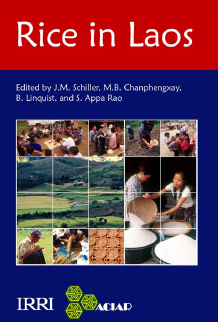 If you've ever wanted to know about what kinds of rice there are in Laos, its history in the country, insecticides and ecology issues, aromatic rice varieties and plethora of other Lao rice topics, then this is one of the most definitive books I've been able to find on the topic. Twenty five chapters worth of information on rice in Laos. Best of all it's free! The non-government organization, International Rice Research Institute, published the book and believe in sharing what they've found and the work that they do. You can read it on Google Books and from there, there`s an additional link from IRRI if you want to download the PDF document from their website.